Shel and Becca appear when Clem is led to work. Becca is talking crap about Clem and Sarah. Overrated : Kenny for sure. Underrated : Mark ! That would maybe explain the bodies of Roman and the other people found on the sides of the river. The guy kinda look darker and a little bit fat ... But i might be wrong ! 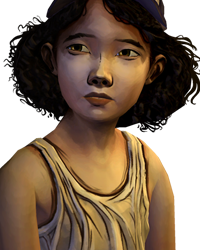 Are you talking about the guy helping Clem with the rope ? I have the feeling that Bonnie goes where it's best for her ... So she doesnt care about hurting people and betray them. Nah this is not Shel ... She do not look like her at all ... Could she be Molly's little sister ? I really hope that they won't die right now ... I mean it would be pointless saving them in the previous episode then getting killed off right after ahah. Thanks anyways for the answers ! Lee forever wasnt trolling ! Ahah ! He was right ! It's official ! It will be out tuesday ! Yay ! An appreciation thread towards my baby ! Well i agree with everything you said. Plus she might have killed Carley/Doug but Kenny killed Larry cold blood and no one said anything about that. She's not a likeable character .. In my eyes. I mean ... So far the whole season is about Carver and his people and his community. So yeah without him Season 2 wouldn't be the same. Let's just pretend it happens ... Well with our society and with what we've seen the outbreak would be ended really soon. No you're not alone. Ben was one of my favorite character.